I hadn’t been to Artisanal in a over a year. It’s one of my favorite restaurants in New York so I made up for it by ordering, eating and drinking twice as much as normal. Luckily, I was with family members who were on the same wavelength. After the usual superb meal (Boulabaise, grouper, skate, cheese courses), we hit the desserts pretty hard especially considering how much wine and cheese we just consumed. 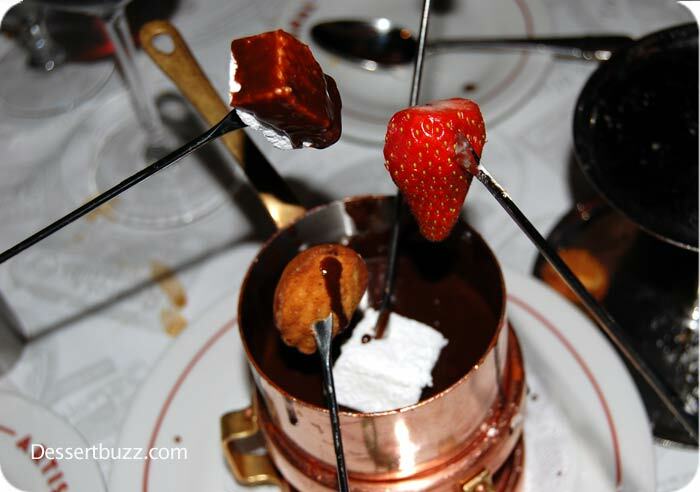 The chocolate fondue for two comes with all kinds of cool stuff plus you get the fun of sitting around a “campfire” at your table. Instead of using sticks from the woods (there are no woods in New York) you get to use fancy French fondue skewers. The copper pot is also a classy touch. The Artisanal chocolate fondue comes with Madeleines, apricots, house made marshmallows, cookies, strawberries and bananas. It must also be noted that the chocolate that comes in the fondue is really perfect. It’s dark but not too dark and just thick enough to cling to the various items you dunk in the pot. 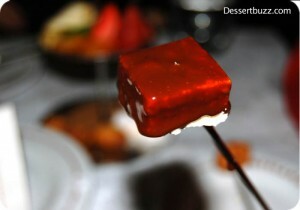 My favorite was the house made marshmallows that had some kind of berry flavor going on. 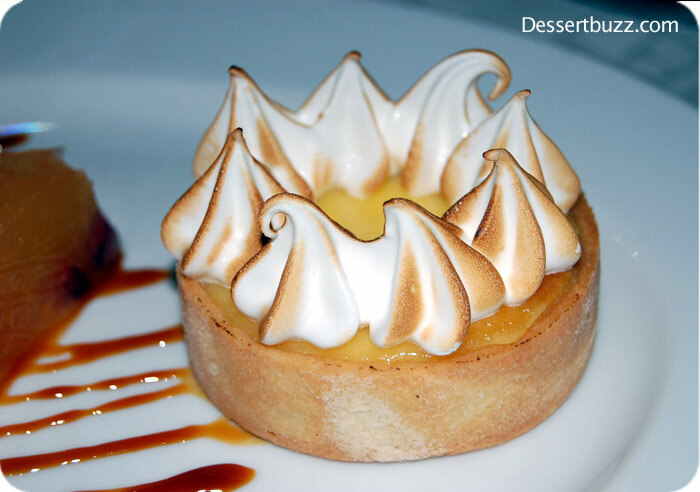 .After two bottles of wine my judgment must have been impaired because I uncharacteristically ordered the citrus tasting dessert rather than the chocolate marquise with vanilla salt and hazelnut sauce. 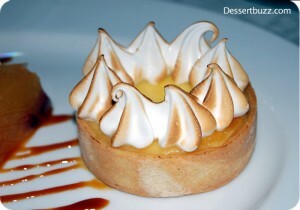 The Lemon Tart looked typical but was really very flavorful and not too heavy for a big showy French pastry. 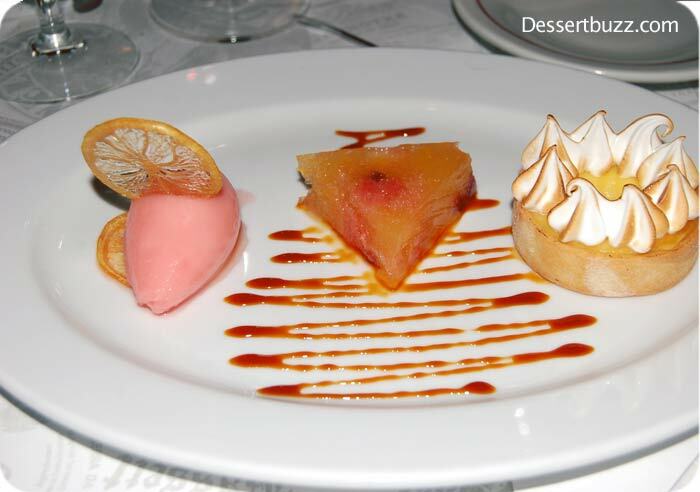 The Grapefruit Terrine was like a huge fruity chunk of triangular cheese on the plate. Dense and tart with a strong grapefruit flavor. 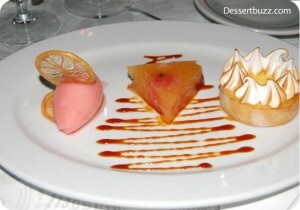 My favorite of the citrus trio was the Lime Compari Sorbet. This was also tart like the terrine but with some sweetness coming from the sugar in the sorbet. There was also a cool candied slice of lime that must have been created in a lab. 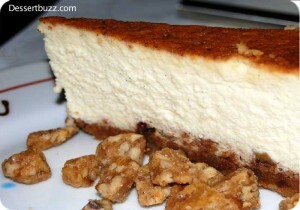 Of course the James Beard Award winning cheese cake is also excellent said my dining cpmpanions. For some reason though I love cheese and almost all desserts I am not a fan of cheese cake. It might be because its so rich it fells you up too fast and prevents you from eating more of the said desserts. Artisanal web site is here. A Google map to the restaurant is here. We absolutely love your blog and find the majority of your post’s to be exactly I’m looking for. Does one offer guest writers to write content available for you? I wouldn’t mind publishing a post or elaborating on many of the subjects you write in relation to here. Again, awesome weblog! I enjoy what you guys are up too. Such clever work and exposure! Keep up the good works guys I’ve included you guys to blogroll. Hello! I know this is somewhat off-topic however I had to ask. Does managing a well-established website like yours take a massive amount work? I’m completely new to writing a blog but I do write in my diary every day. I’d like to start a blog so I can share my experience and thoughts online. Please let me know if you have any suggestions or tips for new aspiring bloggers. Thankyou!